For exactly the reasons that the kid’s reviews on Amazon panned this book, I actually liked it! I read this children’s book with some trepidation, turning each page expecting something bad to happen. Yet, in fact, it turned out to be a rather heartwarming turn of events that I enjoyed. And therein lies the problem. The kid’s reviews on Amazon hate the book…not enough excitement, too slow, too boring. It’s always interesting to me to see that some Newbery Award books just don’t hold it for the children. And not surprising, as the judges of the Newbery are adults! But I digress…Back to Onion John, it’s an odd book, with awkward language, as it tries to emulate a 12-year-old’s slang. It’s got unusual characters, and it’s dated, as it seems to be set pre-WWII. And yet, I think it works as a children’s book. I could certainly see it being used in a classroom. 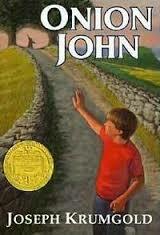 It’s also a good book for boys, as the main characters are all men and boys. And yet… will today’s young boy enjoy it? No blood and guts. No conquering heroes. Nothing to make you quiver and shake. The characters are a little flat. However, it is an honest story about an honest friendship in a plain-old American town. It’s just a simple children’s book. And if it provokes reaction, positive or negative, then it’s serves the purpose of literature.